Hello all – Robin Crowder here. I don’t blog often, but I like to share easy recipes on occasion that our family likes and that I think others might want to try. 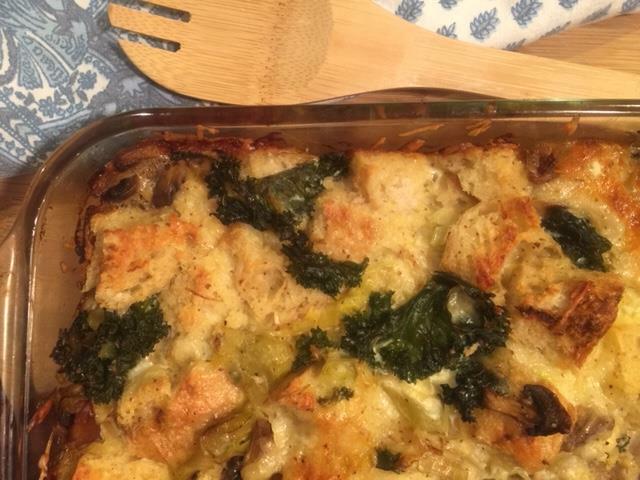 I recently found this tasty recipe for cheesy kale and mushroom strata at bonappetit.com. I was attracted to the great looking photo and the list of ingredients and thought it might make for a good weeknight meal. The good news is that I was right that the recipe is very tasty and our family really enjoyed it. But, the recipe could be made much easier than how its described. In fact, I hardly followed the directions at all and encourage you to do the same! Some of us think measuring can be overrated when it comes to rustic recipes. I do! In this case the 8 eggs is important, as well as the amount of milk but the rest is really flexible. Also, don’t bother following the saute steps very carefully – just throw the mushrooms, garlic, and leeks in a frying pan. Mushrooms first to lightly brown and then the rest. Kale last. I didn’t have my cast iron skillet on hand, so just used a regular frying pan on the stove top. Then when everything was fully incorporated and tossed together I poured it into a 9 x 12 glass baking pan that went in the oven. The Bon Appetit photo is far prettier that the skillet, but ours was still was pleasing to the eye. I served the strata with a simple salad and the family was satisfied. Here’s a link to the Bon Appetit version. See my notes below for adjustments. Write and tell us if you give this a try and let us know if you make any variations that you’d recommend: [email protected]. Preheat oven to 350°. Toast bread in a single layer on a rimmed baking sheet until beginning to dry out but not yet browned, 8–10 minutes. Meanwhile, heat oil in a 12″ cast-iron skillet over medium-high. Arrange mushrooms in a single layer and cook, undisturbed, until lightly browned, about 3 minutes. Add garlic, season generously with salt and pepper, and cook, tossing and reducing heat if needed, until mushrooms are golden brown all over, about 2 minutes. Push to one side and melt 1 Tbsp. butter in center of skillet. Add leeks and season with salt and pepper. Cook, stirring often and mixing into mushrooms, until softened, about 5 minutes. Add kale by the handful, tossing to wilt slightly after each addition, and cook, tossing often, until all of the kale is mostly wilted, about 4 minutes. Transfer kale mixture to a medium bowl. Let skillet cool slightly, then wipe out and coat with remaining 1 Tbsp. butter. Whisk eggs, mustard, 1 tsp. salt, and ½ tsp. pepper in a large bowl until no streaks remain, then whisk in milk. Arrange half of bread in skillet. Cover with half of kale mixture, then top with half of Gruyère and half of Parmesan. Top with remaining bread and kale mixture; pour egg mixture over. Press down on strata with a spatula to help bread absorb egg mixture. Scatter remaining Gruyère and Parmesan over.